We’d love your help. 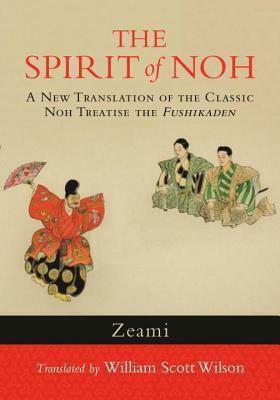 Let us know what’s wrong with this preview of The Spirit of Noh by Zeami. The Japanese dramatic art of Noh has a rich six-hundred-year history and has had a huge influence on Japanese culture and such Western artists as Ezra Pound and William Butler Yeats. The actor and playwright Zeami (1363–1443) is the most celebrated figure in the history of Noh, with his numerous outstanding plays and his treatises outlining his theories on the art. These t The Japanese dramatic art of Noh has a rich six-hundred-year history and has had a huge influence on Japanese culture and such Western artists as Ezra Pound and William Butler Yeats. The actor and playwright Zeami (1363–1443) is the most celebrated figure in the history of Noh, with his numerous outstanding plays and his treatises outlining his theories on the art. These treatises were originally secret teachings that were later coveted by the highest ranks of the samurai class and first became available to the general public only in the twentieth century. To ask other readers questions about The Spirit of Noh, please sign up. A few GR friends asked me about No (Noh) play. I've only watched it live once. I remembered this book by Zeami and am pleasantly surprised it is translated into English. However, my library doesn't carry it. So I downloaded and read the Japanese original here. The original is short (22 pages). I guess this book contains introduction and notes, and I also see it contains one of the Noh script, Atsumori, which is derived from The Tale of the Heike. (Actually, I mentioned that famous story is my re A few GR friends asked me about No (Noh) play. I've only watched it live once. I remembered this book by Zeami and am pleasantly surprised it is translated into English. However, my library doesn't carry it. So I downloaded and read the Japanese original here. Zeami focuses on entertaining the audience, because he believes what delights people delights the divinity as well. His aesthetic is symbolized in "flower." When you are young and beautiful, you have the natural grace (flower). The challenge is how to keep and improve on this natural grace into older age. While he repeatedly says that it's hard to explain in words, Zeami presents some examples, such as: when you play an old man, don't crouch. That's not beautiful. Express the age in more graceful ways. Likewise, when you play an angry person, keep a gentle, resilient mind. Anger expressed blatantly is not beautiful. Everything must be beautiful on the stage. Zeami aims to deliver to the audiences, but he doesn't cater to them. And what supports the delivery? Plain old practice and good thinking. That's the *secret*. Well, I ought to stop before spilling all the beans. If you are really, seriously interested in No play, you might also like Japanese Nō Dramas. I automatically buy all of Wilson's translations and enjoy them very much. As a martial artist this one is less down my alley than some, but still a fascinating read. Kanze Zeami (1364-1444), also called Zeami Motokiyo, was a Japanese actor, playwright, and critic. His theoretical works on the art of the No are as justly celebrated as his dramas.